If it is rainy day or cold winter night, SOBJI KHICHURI / VEGETABLE KHICHDI brings smile on our face. 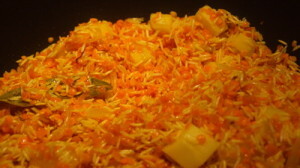 SOBJI KHICHURI / VEGETABLE KHICHDI is a very popular dish. Though this dish is itself a complete diet but we like to have it with with eggplant fry (begun bhaja), egg fry or egg bhuna or hilsa fry or chicken or meat bhuna. I used very few spices here to make it simple. Hope you will enjoy this dish with friends and family. 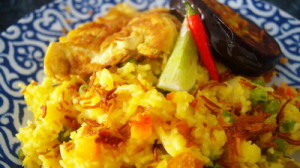 Lentil and Khichuri consistency denpend on your taste, so you can use more or less lentil and water for that. Some of us like to use 3-5 types of lentils which give unique flavour. If you want, you can use roasted moong lentil(ভাজা মুগ দাল), mash kolai dal(মাষ কলাই ডাল), Split pea (বুটের ডাল), you need to soak these lentil at least hour before cooking. Wash the rice and lentil together and if time allows, soak it for 10 minutes. Boil rice-lentil mix with potato,bay leaf, garlic, vegetables, turmeric, salt and 6 cup water under closed lid. If you are using peas, add peas after rice is cooked. When rice cooked, fry onion in oil and pour it khichuri. Mix well and add ghee, green chillies and roasted cumin powder and cook 10 more minutes on low heat under closed lid. Check the salt. 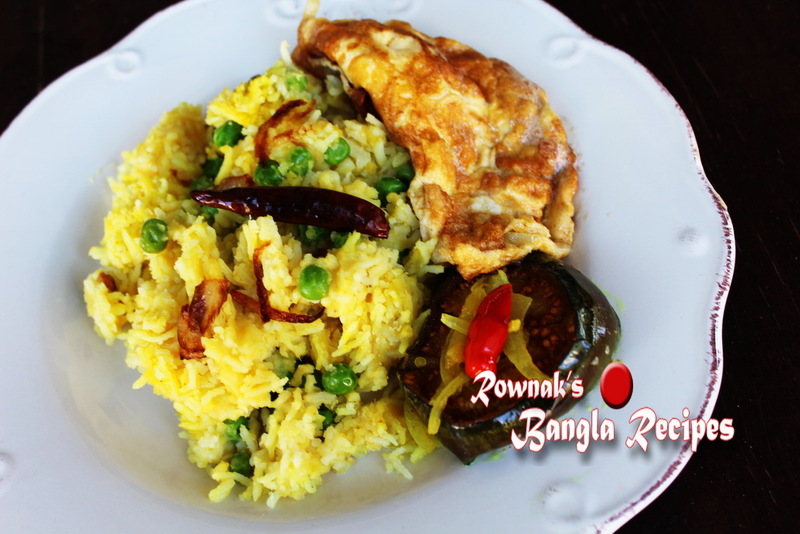 Serve hot SOBJI KHICHURI / VEGETABLE KHICHDI with eggplant fry (begun bhaja), egg fry or egg bhuna or hilsa fry. 1. You can fry onion first, add rest ingredients and boil. 2. Water may need more or less, depend your taste. Personally I dont like too runny, But its totally up to your taste. 3. If you are using frozen vegetables, use less water and add vegetables when you are adding ghee. 4. If you don’t want to use ghee, add more oil. 5. If you want use more vegetables, use less water.